TFS lease 36months/36000 miles allowed. $3,655 cash or trade due at signing. Payment excludes tax, title, registration, insurance, $399 doc fee, and $199 vehicle prep fee. $650 Acquisition fee included, $0 Security Deposit. Lessee pays excess wear and tear and $0.15 mile charge for mileage over 36000 at end of lease. Excludes $350 disposition fee due at lease end. Lease end purchase option: $17715. Program only available to customers with well qualified credit through Toyota Financial Services. Not all customers will qualify. 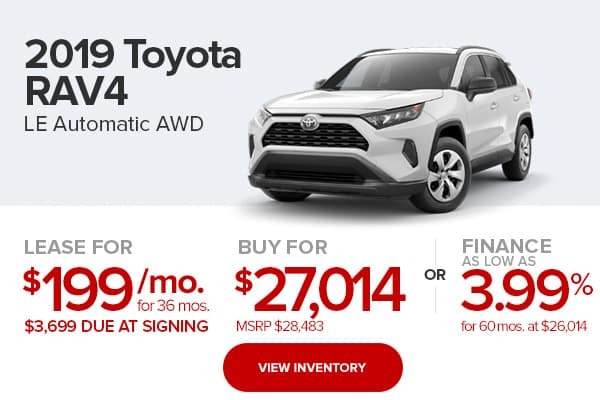 Delivery must be taken from Harr Toyota by 4/30/19. Purchase price includes $500 customer cash directly from Toyota Motor Sales, USA, Inc. May not be combined with finance or lease offer. Tax, title, registration, insurance, $199 vehicle prep fee, and $399 doc fee are additional.Expires 4/30/19. On approved credit. Cannot be combined with purchase offer 1.9% APR financing for 72 months. 72 monthly payments of $14.71 for each $1,000 borrowed. Tax, title, registration, insurance, $199 vehicle prep fee, and $399 doc fee are additional. Terms are available to well-qualified buyers through Toyota Financial Services. Not all buyers will qualify Total amount financed cannot exceed MSRP plus options, tax, and license fees. Expires 4/30/19. TFS lease 36months/36000 miles allowed. $3,699 cash or trade due at signing. Payment excludes tax, title, registration, insurance, $399 doc fee, and $199 vehicle prep fee. $650 Acquisition fee included, $0 Security Deposit. Lessee pays excess wear and tear and $0.15 mile charge for mileage over 36000 at end of lease. Excludes $350 disposition fee due at lease end. Lease end purchase option: $14060. Program only available to customers with well qualified credit through Toyota Financial Services. Not all customers will qualify. 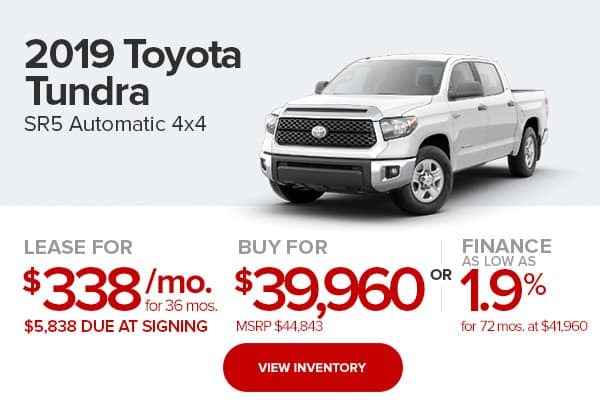 Delivery must be taken from Harr Toyota by 4/30/19. Purchase price includes $500 customer cash directly from Toyota Motor Sales, USA, Inc. May not be combined with finance or lease offer. Tax, title, registration, insurance, $199 vehicle prep fee, and $399 doc fee are additional. Expires 4/30/19. On approved credit. Cannot be combined with purchase offer. 3.99% APR financing for 60 months. 60 monthly payments of $17.05 for each $1,000 borrowed. Tax, title, registration, insurance, $199 vehicle prep fee, and $399 doc fee are additional. Terms are available to well-qualified buyers through Toyota Financial Services. Not all buyers will qualify Total amount financed cannot exceed MSRP plus options, tax, and license fees. Expires 4/30/19. TFS lease 36months/36000 miles allowed. $4,782 cash or trade due at signing. Payment excludes tax, title, registration, insurance, $399 doc fee, and $199 vehicle prep fee. $650 Acquisition fee included, $0 Security Deposit. Lessee pays excess wear and tear and $0.15 mile charge for mileage over 36000 at end of lease. Excludes $350 disposition fee due at lease end. Lease end purchase option: $27230. Program only available to customers with well qualified credit through Toyota Financial Services. Not all customers will qualify. Delivery must be taken from Harr Toyota by 4/30/19. May not be combined with finance or lease offer. Tax, title, registration, insurance, $199 vehicle prep fee, and $399 doc fee are additional. Expires 4/30/19. On approved credit. Cannot be combined with purchase offer.3.9% APR financing for 60 months. 60 monthly payments of $18.37 for each $1,000 borrowed. Tax, title, registration, insurance, $199 vehicle prep fee, and $399 doc fee are additional. Terms are available to well-qualified buyers through Toyota Financial Services. Not all buyers will qualify Total amount financed cannot exceed MSRP plus options, tax, and license fees. Expires 4/30/19. TFS lease 36months/36000 miles allowed. $4,116 cash or trade due at signing. Payment excludes tax, title, registration, insurance, $399 doc fee, and $199 vehicle prep fee. $650 Acquisition fee included, $0 Security Deposit. Lessee pays excess wear and tear and $0.15 mile charge for mileage over 36000 at end of lease. Excludes $350 disposition fee due at lease end. Lease end purchase option: $10010. Program only available to customers with well qualified credit through Toyota Financial Services. Not all customers will qualify. 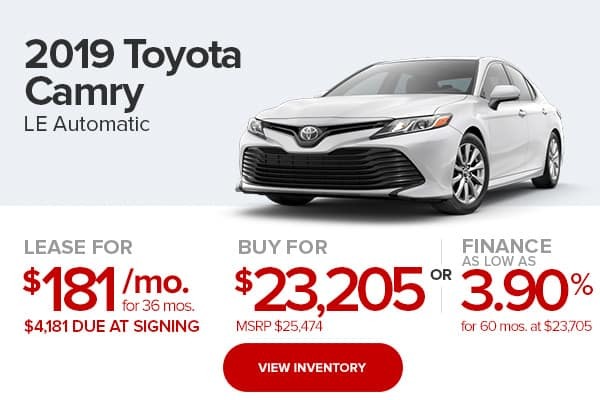 Delivery must be taken from Harr Toyota by 4/30/19. Purchase price includes $1000 customer cash directly from Toyota Motor Sales, USA, Inc. May not be combined with finance or lease offer. Tax, title, registration, insurance, $199 vehicle pep fee, and $399 doc fee are additional. Expires 4/30/19. On approved credit. Cannot be combined with purchase offer.3.9% APR financing for 60 months. 60 monthly payments of $14.71 for each $1,000 borrowed. Tax, title, registration, insurance, $199 vehicle prep fee, and $399 doc fee are additional. Terms are available to well-qualified buyers through Toyota Financial Services. Not all buyers will qualify Total amount financed cannot exceed MSRP plus options, tax, and license fees. Expires 4/30/19. TFS lease 36months/36000 miles allowed. $4,181 cash or trade due at signing. Payment excludes tax, title, registration, insurance, $399 doc fee, and $199 vehicle prep fee. $650 Acquisition fee included, $0 Security Deposit. Lessee pays excess wear and tear and $0.15 mile charge for mileage over 36000 at end of lease. Excludes $350 disposition fee due at lease end. Lease end purchase option: $14142. Program only available to customers with well qualified credit through Toyota Financial Services. Not all customers will qualify. 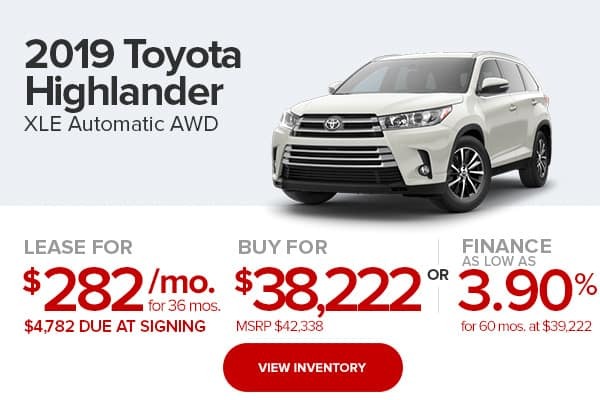 Delivery must be taken from Harr Toyota by 4/30/19. May not be combined with finance or lease offer. Tax, title, registration, insurance, $199 vehicle prep fee, and $399 doc fee are additional.Offer expires 4/30/19. On approved credit. Cannot be combined with purchase offer. 3.9% APR financing for 60 months. 60 monthly payments of $17.05 for each $1,000 borrowed. Tax, title, registration, insurance, $199 vehicle prep fee, and $399 doc fee are additional. Terms are available to well-qualified buyers through Toyota Financial Services. Not all buyers will qualify Total amount financed cannot exceed MSRP plus options, tax, and license fees. Expires 4/30/19. TFS lease 36months/36000 miles allowed. $5,838 cash or trade due at signing. Payment excludes tax, title, registration, insurance, $399 doc fee, and $199 vehicle prep fee. $650 Acquisition fee included, $0 Security Deposit. Lessee pays excess wear and tear and $0.15 mile charge for mileage over 36000 at end of lease. Excludes $350 disposition fee due at lease end. Lease end purchase option: $26886. Program only available to customers with well qualified credit through Toyota Financial Services. Not all customers will qualify. 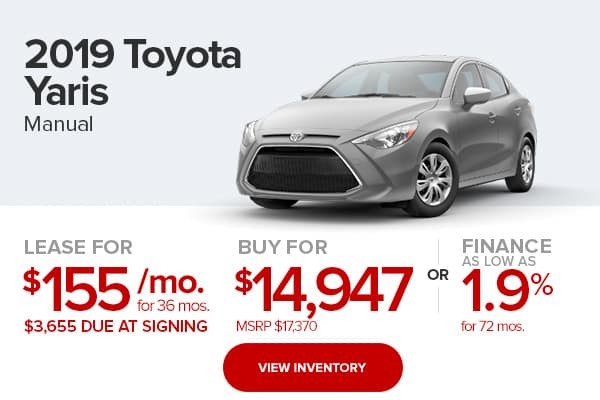 Delivery must be taken from Harr Toyota by 4/30/19. Purchase price includes $1000 customer cash directly from Toyota Motor Sales, USA, Inc. May not be combined with finance or lease offer. Tax, title, registration, insurance, $199 vehicle prep fee, and $399 doc fee are additional. Expires 4/30/19.